The Indigenous People of Biafra (IPOB) and the Movement for the Actualisation of the Sovereign State of Biafra (MASSOB) may be heading for a showdown over the former’s order to the Igbo to observe another ‘sit-at-home’ on May 30, 2018 in commemoration of those who lost their lives during the bloody 30-month civil war on the Biafran side. MASSOB, otherwise called Biafra Independent Movement (BIM), has issued a counter directive, urging people of the south east geopolitical zone to ignore IPOB’s order and go about their normal business on that day. The Anambra South zonal leader of MASSOB-BIM, Chief Tony Nwodo, who made the counter-declaration in Onitsha, Anambra state over the weekend, argued that the MaziNnamdiKanu-led IPOB did not possess such power to order the people of the Southeast and other Igbo speaking areas to sit at home. 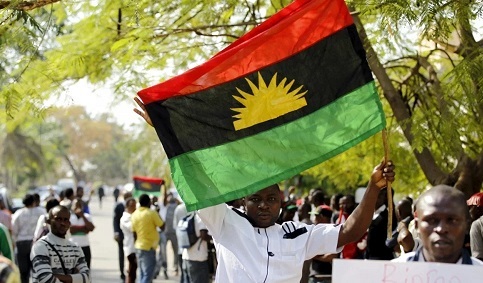 “If such an order will be issued out (sic), it will come from the founder and leader of MASSOB-BIM and EzeigboGburugburu, Chief Ralph Uwazuruike,” Nwodo argued. According to him, “IPOB is not the mouth-piece of the Igbo nation and such an order is meant only for its members and not for the Igbo. All IPOB is saying in the newspapers, social media and radio through its Director of Media and Publicity, NnamdiKanu, are lies, null and void and of no effect,” he further claimed. “IPOB members are not even freedom fighters but mere frustrated group of dissidents formerly under Chief Uwazuruike’s leadership but sacked over anti-MASSOB activities. It is that violent attitude which they possessed and were displaying then that earned them sack as MASSOB members and they went and formed IPOB, led by NnamdiKanu”, he disclosed. According to him, all the pro Biafra agitators have their origin in MASSOB but have chosen to fight against Chief Ralph Uwazuruike. “When you fight your master or the finger that feeds you, you will expect nothing but your down fall, and that is what is happening to IPOB today,” Nwodo said. 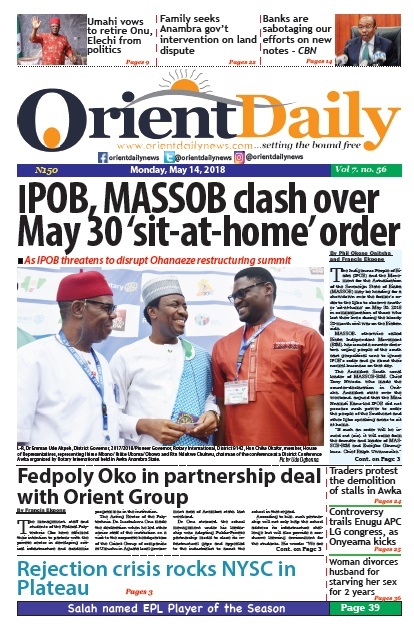 Nwodo also used the opportunity to urge the Igbo to “team up with members of MASSOB-BIM in the celebration of ‘Biafra Day’ on May 22, stressing that there will be no sit-at-home as ordered by IPOB” and that “everybody will be free to go on their legitimate businesses that day”. IPOB leadership is yet to respond to the salvo fired by the MASSOB leader and their threat to pull the plug on the planned sit-at-home in commemoration of Biafran heroes on May 30, as at press time.